U.S. Immigration, Customs and Enforcement agents arrested two undocumented immigrants in Hayward last Thursday, but the city says, based on its policies, it did not participate in the action. The Hayward Police Department, however, had been notified two days prior, on Tuesday, of ICE’s intention to check-up on some individuals currently being monitored by GPS the city said on Monday. The two individuals arrested at the Rainbow Apartments on Harris Road were not the intended targets of ICE agents, according to the San Jose Mercury News, but two others were taken into custody, both undocumented immigrants from Mexico, who have lived and worked in the U.S. for the past 10 years. A spokesperson for ICE told the newspaper that both had previously committed criminal offenses and one had twice been deported to Mexico. Hayward officials say they have no information on the arrests and a request for further information from ICE has already been made. But the optics of the arrests, which according to the Mercury News, also included ICE agents knocking on the doors at the complex for two hours last Thursday and yelling out the names of the men whom they originally sought, is the type of incident that has already put many in the community on edge for months. There was also a suggestion by the families of those arrested that the men were racially-profiled by ICE. According to the report, both were trailed by agents while they drove to work early Thursday morning in an effort to discern whether they were the men ICE were seeking. After the men produced identification issued by the Mexican government, they were arrested, according to the families. Fears of ICE agents conducting raids in Hayward were a common refrain during the recent debate last June over the city declaring a sanctuary city. Numerous public officials and Police Chief Mark Koller had stressed that the designation would do little to stop federal agents from conducting investigations or raids in the city. But they also assured the city and police department’s existing policy prohibits its employees from seeking information regarding someone’s immigration status. “No HPD officer or Hayward city employee may assist federal officials in the enforcement of U.S immigration laws. We are committed to equal treatment of all of our residents regardless of immigration status,” the city said in a statement Monday morning. There have been several reports in recent months that suggest President Donald Trump’s rhetoric and ICE’s crackdown on undocumented immigrants has not only created immense fear in immigrant communities, but is also resulting in a sharp decrease in reports of alleged crimes in these communities. The fear being, undocumented immigrants who witness crimes are dissuaded with helping law enforcement for fear of also being arrested and potentially deported. Posted in arrests, Hayward, Hayward Police, ICE, ICE agents, immigrants, immigration, Mark Koller, sanctuary city, undocumented. Bookmark the permalink. 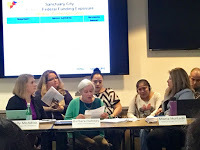 It is good to see that Mayor Halliday has stood up for her ethnically diverse community and seen that along with her brethren city representatives that she sold out cheap to Trump and his ICE Migra storm troopers. Two down, and 12 million+ illegals to go! High ranking and prominent Democrats, and such as for example Nancy Pelosi and similar creatures, pretend that the reason they are for sanctuary ordinances is supposedly because they are great liberals and wonderful humanitarians. However, let's look at which groups vote overwhelmingly for Democratic Party candidates and which groups vote overwhelmingly for Republican Party candidates. Poor people, people on welfare, recent immigrants, and uneducated people, and especially high school dropouts, vote overwhelmingly for DP candidates. However, successful people, educated people, and members of families that make over 100K per year vote overwhelmingly for Republican Party candidates. So in other words if the Democratic Party is to have any chance whatsoever of winning elections, then it needs plenty of poor people, plenty of uneducated people, plenty of people on welfare, and plenty of recent immigrants. So therefore do not believe any of the lies and garbage from the highest ranking members of the DP that supposedly they want to make things better and they want the economy to drastically improve. Of course the biggest problem that the sleazy organized crime ring of parasites, scam artists, and bloodsucking leeches that runs the DP is having is that in in the last few elections a considerable portion of the groups that for decades had been automatically voting “D” by overwhelming margins have been getting wise to the fact that the big boys in the DP: one, are not their friends but their enemies; and two, screw up virtually everything they touch. NOTE: To give just two examples of the “competence” of “liberals” and the idiocy of their programs designed to make things “better,” Chicago's mayor is Rahm Emmanual, an extreme Obama style liberal, and the more stupid programs he comes up with to “improve” things the higher Chicago's murder rate climbs. And in Baltimore the DA is a big phony, world class windbag, and extreme “liberal” named Marilyn Mosby, and who is extremely talented at calling people she does like racists, and, not surprisingly, the more birdbrained programs she “thinks” up to “improve” things the higher Baltimore's murder rate climbs. And that is all the more reason the DP needs plenty of immigration, and both legal and illegal, if it is to have any chance whatsoever to win future elections. And still worse for the DP is that even if by some miracle it manages in the next few elections to hold onto most of the Rust Belt, in other words such states as Illinois, Michigan, Ohio, Pennsylvania, and New York, and so forth, in recent decades those states portion of the electoral college has been drastically shrinking, and most of the population growth has been occurring in states in which even a few decades ago the DP already had problems winning elections. So as to keep virtually everybody at least reasonably happy, Hayward could use the Scams FraudsFIXso system for “communicating” and “cooperating” with the federal government in regard to “notifying” Immigration when it is holding an undocumented alien that is about to be released. The way the city of Scams FraudsFIXso “proves” that it follows US law in regard to informing the federal government before an undocumented alien is about to be released is that first it releases the undocumented alien, and let's say at 4PM today, and then after the undocumented alien is already released it makes out a backdated letter, and let's say stamped for instance 10AM, and that it then faxes over to federal Immigration after the undocumented person has already been released from jail. NOTE: Alameda County's Public Works Agency engages in a similar system of choreographed lies and fraud if it receives a letter from a County resident describing a health and/or safety violation that Public Works has no intention of repairing unless some palms are greased. However AC Supervisor Nate Miley “knows” that Public Works is composed of employees so extremely intelligent, so extremely competent, and so extremely honest, that therefore anything those professional pathological liars write up: one, should be treated as the gospel truth and just like a letter from heaven; and two, illegal to challenge. Let me make a correction to my previous post of 10:28PM. In other words, I should get a pair of reading glasses, and then my proofreading would probably improve. As far as the “quality” of my typing, since I am a self taught typist, agues I am a lousy teacher.